Captain Witold Pilecki was a Polish hero who, amongst many of his heroic deeds in World War II, volunteered to be captured and sent to Auschwitz-Birkenau camp (“Auschwitz”). 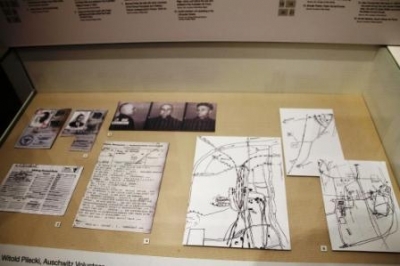 While in Auschwitz he authoritatively documented that the camp was being used for the mass extermination of Jewish people and through his contacts in the Polish Resistance he informed the Allies of the true purpose of Auschwitz. 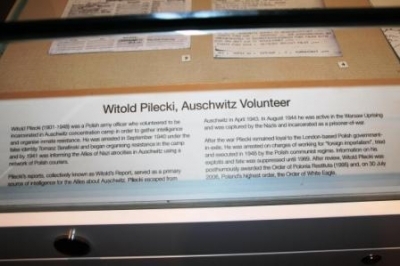 (For details on Captain Pilecki's life and heroic deeds, please refer to an earlier LPJ article: The Auschwitz Volunteer by Andrew Balcerzak. Captain Pilecki could not have imagined the lasting and universal affect his heroism would have on future generations. 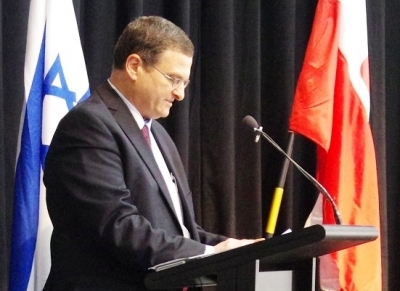 Some 70 years after his heroic deeds he was honoured by members of the Polish and Jewish communities on the other side of the world in a ceremony hosted at the Jewish Holocaust Centre (JHC) in Melbourne, Australia. On 16th February 2014, the ceremony was conducted before 240 people who had filled the JHC's lecture theatre and gathered to pay their respects to Captain Pilecki and witness the formal presentation of historical documents and a copy of a new book to the JHC. 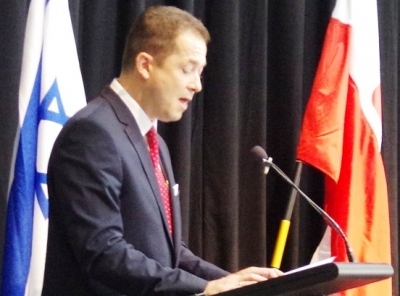 The Pilecki Project Committee, an initiative set up by Melbourne's Polish community, presented the JHC with certified copies of Captain Pilecki's original documents, donated by the Polish Institute of National Remembrance, and a new book translation of Captain Pilecki's “Report W Auschwitz 1940-1943” which was funded by members of Melbourne's Polish community. The new book is an English translation of Report W, which was the first authoritative report of the genocide being committed at Auschwitz. The ceremony was introduced by Mr Warren Fineberg, Executive Director of the JHC. Among the distinguished guests introduced by Mr Fineberg were His Excellency Mr Pawel Milewski, Ambassador of the Republic of Poland and His Excellency Mr Shmuel Ben-Shmuel, Ambassador of the State of Israel. In greeting the audience Mr Milewski spoke of the extraordinary contribution made to history by Captain Pilecki, a man regarded as one of Poland's greatest heroes. Mr Ben-Shmuel endorsed Mr Milewski's sentiments and reminded the audience of the obligation to respect history and to do so by speaking out where there is wrongdoing because "we are the guardians of never again!" The ceremony continued with three keynote speeches celebrating the life and heroism of Captain Pilecki. A speech was made by Dr Helen Evert, President of the Polish Museum & Archives in Australia, who also discussed with Mr Zbigniew Leman the Warsaw Uprising of 1944 and Captain Pilecki's participation in the Uprising following his escape from Auschwitz. Speeches were also given by Dr Lukasz Kaminski, President of the Institute of National Remembrance and Dr Rafal Leskiewicz, Director of the Office for the Preservation and Dissemination of Archive Records. Drs Kaminski and Leskiewicz flew from Poland to Australia especially to attend and contribute to the ceremony. After the keynote speeches, the Pilecki Project Committee formally presented the documents and book to the JHC. The ceremony concluded with a vote of thanks from Mrs Pauline Rockman OAM, President of the Melbourne JHC, and the screening of a multimedia presentation prepared by Mr Daniel Brewinski.